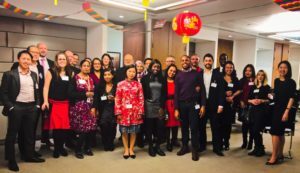 IP & ME’s inaugural event was a post-work celebration of Chinese New Year. One of the leading lights in all things diversity-related, Baker McKenzie, very kindly hosted us in their London office near St Paul’s. This was an informal event with a focus on having fun! Our guest speakers Jenny He (Software Engineer and Senior Inventor, IBM) and Saufung Ma (Senior Associate, Taylor Wessing LLP) gave us some background to the traditions and cultural significance of Chinese New Year, as well as tips on business and cultural awareness. Following that, over Chinese-themed refreshments, there was a chance to network with fellow supporters of IP & ME. The event was open to all IP professionals and their colleagues, free of charge. Guests were asked to wear something red, to symbolise good luck. And despite coinciding with the “Beast from the East”, the evening was well attended and great fun for all.